While the study of Calculus may not have been your thing back in design school, the person who developed Calculus also influenced the color wheel you use today. The color wheel’s roots date back to the mid-1600s when Sir Isaac Newton’s work with white light led him to the discovery of the visible spectrum of light. 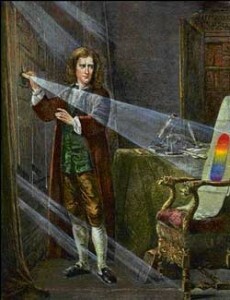 Newton observed the way each color of light would bend as it passed through the prism. You may have learned the term “ROY G BIV” (red, orange, yellow, green, blue, indigo and violet) in elementary school science class. “ROY G BIV” was the result of Newton’s discovery. It turns out that A.H. Munsell and Newton shared the concept of likening color notation to music notation. In his original color wheel (1704), Sir Isaac Newton included musical notes correlated with color beginning with red and dividing the circle by the musical scale starting with D and ending with the octave of D. It was no surprise that violet and purple colors are located next to red on the color wheel, since these colors are considered non-spectral and mixtures of red and violet light. Munsell’s color wheel and subsequent books of color follow a similar color order as Sir Isaac Newton’s color wheel—the colors representing the visible spectrum of light—ROY G BIV—placed on a wheel. While it appears as though the color wheel is the visible spectrum of colors placed on a wheel, the real basis for the color wheel is rooted in Sir Isaac Newton’s experiments with prisms. His experiments led to the theory that red, yellow and blue were the primary colors from which all other colors are derived. While that’s not entirely true, it’s still influential in the color wheels developed in the early 1800s as well as the color wheel currently used today. Add to that the secondary colors of violet, orange and green—those which result from mixing the primary colors—and the color wheel begins to take shape. The tertiary colors yellow-orange, red-orange, red-purple, blue-purple, blue-green and yellow-green complete the color wheel. If these colors sound familiar, that’s because they’re similar to Munsell’s hue circle. The value of the color wheel is its ability to help designers create appealing palettes by applying the underlying theory of the color wheel with the way we see color. For example, a palette based on color wheel complementary colors would include colors that are opposite each other on the color wheel, such as red and green. Applying these same color principles, the Munsell books of color are organized like the color wheel, but with even more color possibilities, giving designers a useful tool that works the way they work. Learn how Munsell color communications products can help you develop color more effectively. Hello There. I discovered your weblog the use of msn. This is a very neatly written article. I will be sure to bookmark it and come back to learn more of your useful info. Thanks for the post. I will certainly comeback. Again note….These are not the only colors found in white light nor not even inclusive of all non visible colors in white light.